1 The period in European art history that became known as Rococo was unusual. It wasn't mainly a style of painting, sculpture, or even architecture. 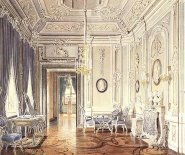 Rococo, originally, was a style of decorating. 2 It was begun by members of the aristocracy in France who wanted elegance and style but were tired of the dark, serious Baroque style that had been in fashion for some time. They began to furnish their homes with a new, glittering, picturesque look. 3 Walking into a room decorated in the Rococo style was like walking right into an elaborate work of art. Everything in the room contributed to the full effect, and visitors could spend all day just admiring all of the creative touches in the room.